Have you noticed your basement floods every time it rains? Or maybe water pools in your yard, creating puddles and damaging your lawn. Either way, you could have serious drainage issues, but luckily, Landis Services, LLC can correct them. Located in Loveland, OH, this certified drainage contractor offers a variety of drain management services to keep your land, flower beds, and crops puddle-free. This drainage contractor has the tools and equipment necessary to move earth around your property so they can access your drains and repair or replace the systems that are causing you issues. If your yard is threatened by erosion and pools of water, you can rely on the drainage solutions provided by Landis Services to resolve your problems quickly. 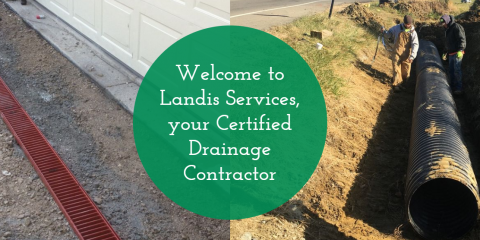 If you need a drainage contractor, Landis Services has all of the draining solutions you might need. Call them today at (513) 943-4600 to get started or visit them online for more information.